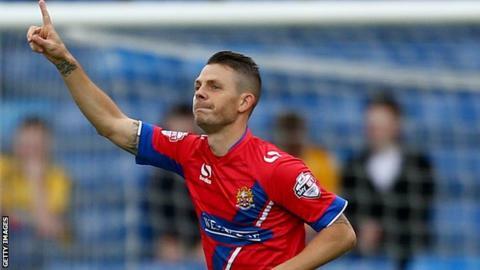 Veteran striker Jamie Cureton grabbed a hat-trick as Dagenham & Redbridge thumped AFC Wimbledon. Cureton opened the scoring inside two minutes, heading in after a lovely move involving Andre Boucaud, Billy Bingham and Christian Doidge. The Dons should have levelled but Craig Tanner headed wide from close range. And the Daggers dominated after the break, Scott Doe heading in number two, Cureton hitting a third and then curling in a classy fourth. Cureton, at the age of 39 years and 222 days, is the oldest player to score a hat-trick in the Football League this season. The hosts moved up to 15th in League Two, just two places and two points behind the Dons, who have 54 points and are now eight points adrift of the play-off places. "The second two goals were very good the first one was okay, but it's a hat-trick and it's helped us win the game. "We'd been sticking around on the late 40-points so we've gone into the 50 mark. The boys played well and it was a deserved victory. "The games mean a lot more to me now and being able to still be able to play, I'm very pleased and thankful that I can do that. Score goals as well I will be a very happy man and I will be talking about them for a few days. "We could say how unlucky we were and that we should have been four up but we weren't. "They had a striker on the pitch who was 37 and they had about six chances all game and he took three of them with quality - we didn't have that and because of that we've lost a game. "It wasn't a 4-0, we know it wasn't but the score line tells you it was. "I should take the rap for it. We needed to win five out of six minimum and I decided to go all out attack and try and win the game away from home." Match ends, Dagenham and Redbridge 4, AFC Wimbledon 0. Second Half ends, Dagenham and Redbridge 4, AFC Wimbledon 0. Attempt saved. Daniel Carr (Dagenham and Redbridge) right footed shot from the right side of the box is saved in the centre of the goal. Attempt missed. Tom Beere (AFC Wimbledon) right footed shot from outside the box is close, but misses to the right. Substitution, AFC Wimbledon. Tom Beere replaces George Francomb. Substitution, Dagenham and Redbridge. Jodi Jones replaces Jamie Cureton. Substitution, Dagenham and Redbridge. Daniel Carr replaces Ashley Hemmings. Corner, AFC Wimbledon. Conceded by Scott Doe. Attempt blocked. George Francomb (AFC Wimbledon) right footed shot from the right side of the box is blocked. Attempt saved. Alfie Potter (AFC Wimbledon) right footed shot from outside the box is saved in the centre of the goal. Substitution, AFC Wimbledon. Ryan Sweeney replaces Sean Rigg. Substitution, AFC Wimbledon. Adebayo Azeez replaces Adebayo Akinfenwa. Goal! Dagenham and Redbridge 4, AFC Wimbledon 0. Jamie Cureton (Dagenham and Redbridge) right footed shot from the centre of the box to the top right corner. Assisted by Ashley Hemmings. Attempt blocked. Adebayo Akinfenwa (AFC Wimbledon) header from the centre of the box is blocked. Corner, AFC Wimbledon. Conceded by Billy Bingham. Attempt blocked. Adedeji Oshilaja (AFC Wimbledon) right footed shot from outside the box is blocked. Goal! Dagenham and Redbridge 3, AFC Wimbledon 0. Jamie Cureton (Dagenham and Redbridge) right footed shot from the centre of the box to the centre of the goal. Assisted by Abu Ogogo. Attempt saved. Jamie Cureton (Dagenham and Redbridge) right footed shot from the left side of the box is saved in the top centre of the goal. Attempt missed. Sean Rigg (AFC Wimbledon) left footed shot from the left side of the box misses to the right. George Francomb (AFC Wimbledon) wins a free kick in the defensive half. Attempt blocked. Craig Tanner (AFC Wimbledon) right footed shot from outside the box is blocked. Craig Tanner (AFC Wimbledon) wins a free kick in the attacking half. Corner, Dagenham and Redbridge. Conceded by Dannie Bulman. Corner, AFC Wimbledon. Conceded by Mark Cousins. Attempt saved. Jake Reeves (AFC Wimbledon) right footed shot from outside the box is saved in the top centre of the goal. Corner, AFC Wimbledon. Conceded by Abu Ogogo. Goal! Dagenham and Redbridge 2, AFC Wimbledon 0. Scott Doe (Dagenham and Redbridge) header from very close range to the bottom right corner. Assisted by Andre Boucaud with a cross following a corner. Attempt blocked. Ashley Hemmings (Dagenham and Redbridge) right footed shot from the centre of the box is blocked. Ashley Hemmings (Dagenham and Redbridge) wins a free kick in the attacking half. Sean Rigg (AFC Wimbledon) wins a free kick on the right wing. Attempt missed. Craig Tanner (AFC Wimbledon) left footed shot from outside the box misses to the right.